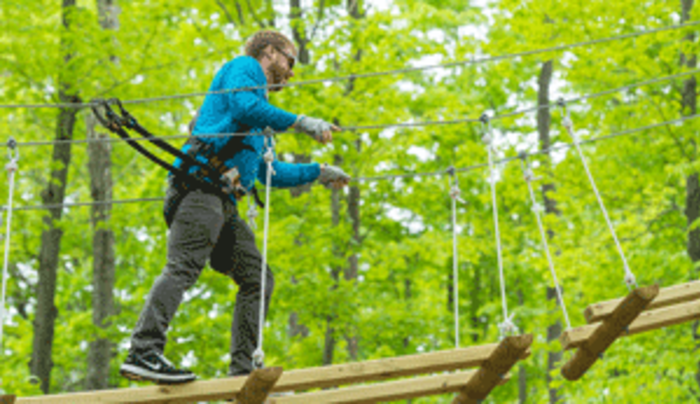 Aerial Adventure Course & Ziplines! Challenge your agility, balance and strength as you encounter Peek'n Peak's brand new Aerial Adventure Course! This treetop adventure consists of 69 obstacles in 8 separate courses of varying difficulties - ranging from the purple course, suitable for ages 5 & up, to the double black diamond course... sure to challenge even the most elite athlete! A 3-hour, self-guided experience allows visitors to explore the course at their own pace and to try any (or all!) of the eight different courses, working their way through the tree tops, from platform to platform, encountering obstacles along the way. Obstacles include rope bridges, zip lines, tight ropes, cargo nets, ladders and much more! Giant Dual Ziplines - Take a thrilling ride down the mountainside! 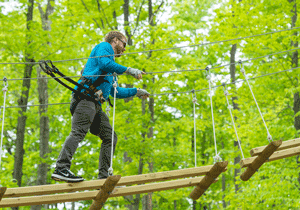 Soar through the air and over the treetops on the Peak's Mountain Zipline ride. With side by side ziplines, allowing you to race a friend, you'll zip two unique lines totaling more than 2,000 feet of high flying fun!